We are well versed with Abandoned Orders tab of Abandoned Cart Pro for WooCommerce plugin where you can find the entire abandoned carts’ listing and its details. 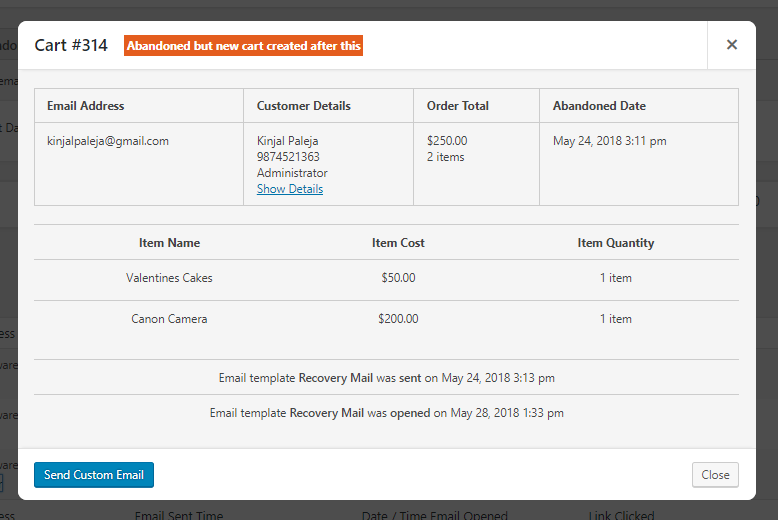 We have introduced a new feature in version 4.8where an Abandoned Order Popup modal appears when you click on More info button of any abandoned order. This popup modal displays all the related details and you can even send a custom email to the customer from this popup itself. Let us see how this works? As you can notice, all the other details like Billing and Shipping address, Shipping charges and IP address which are captured during the process of purchasing, is all displayed here. Here you can see that all the details of an abandoned order is displayed. But remember that you can only get to see the details of abandoned orders and not recovered orders under Sent Emails tab. 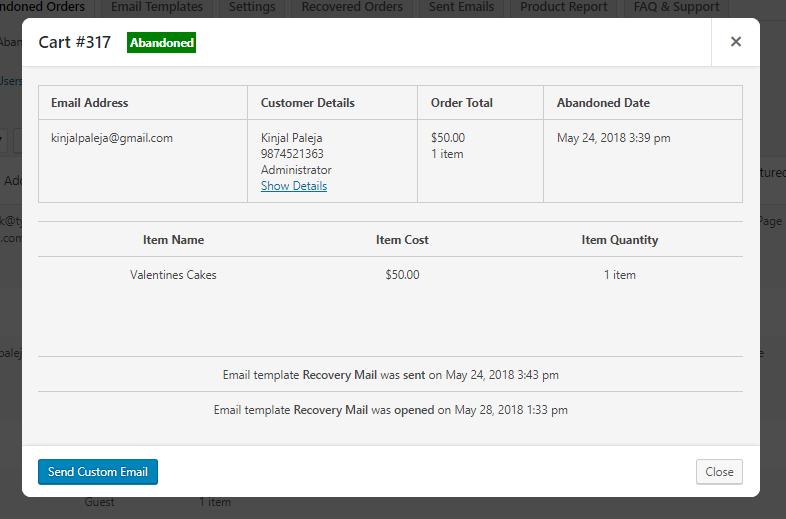 The addition of this new feature makes it possible to display all the abandonment details, customer and product details, details of reminder emails as well as entire order details in a single popup. Admin need not go anywhere in the plugin but simply click on the View details page of desired abandoned cart and can produce all the details he requires about the abandoned cart. 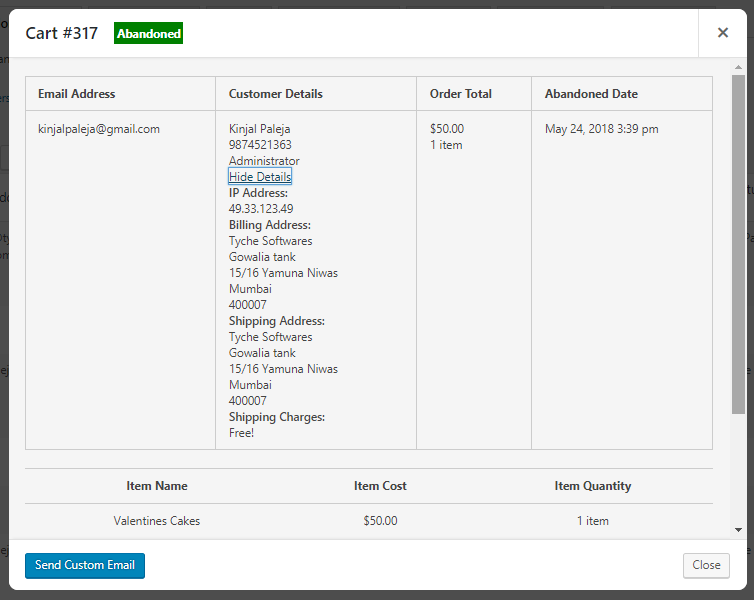 Such enhancements indeed makes the Abandoned Cart Pro for WooCommerce plugin worthwhile and more useful.